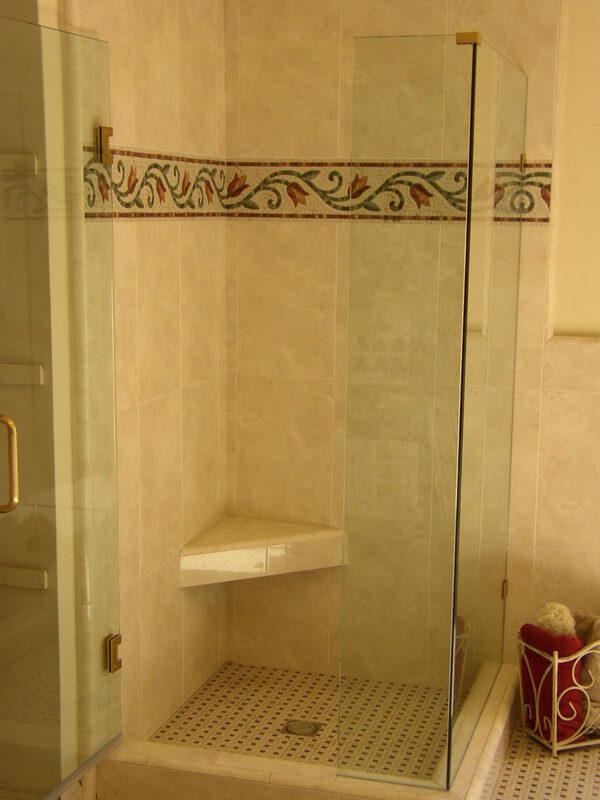 Better-Bench, The Shower Bench Solution! Now available, the Better-Bench R-26! A new rectangular, NON adjustable Better-Bench that is set at 26″. 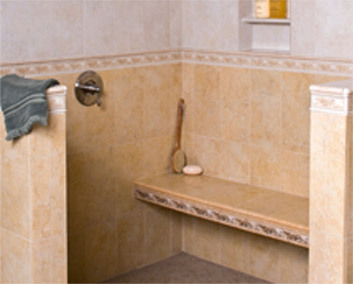 This Bench is designed to fit into the smaller spaces while maintaining an elongated bench look for your shower. The NEW BB-R26 is also engineered for a 400 LB load capacity. Self-supporting, one-piece frame is easy to install with supplied fasteners, requiring no additional waterproofing or structural reinforcement. Long lasting and corrosion resistant materials throughout. Better-Bench® products are manufactured in the U.S.A.
Products listed below are produced of an alloyed aluminum and are sent as one piece. 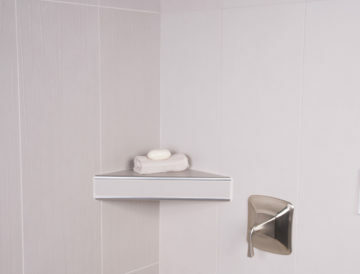 All products are supplied with hollow wall anchors and wood screws. Fastening to studs, blocking, or other framing members is not required. If framing members are encountered, discard hollow wall anchor and use the provided screw with an appropriate pilot hole. Can this bench really hold the weight? YES! Better-Bench products have a structurally engineered 400 lb (OR 100 lb for the BT-17) live load capacity without the need to connect directly to the wood framing inside the wall. Over 10 years of successful installations performed by professional contractors and homeowners alike provides a high level of assurance. This capability is achieved through the engineering of “shear force” rather than pull-out or “tension” loading. For instance, you may be familiar with the ease of pulling a fixture of some sort out of a wall when attached with hollow wall anchors in 1/2″ gyp board. Have you ever tried to push that fixture straight down? Our suggestion is to try one—you will be amazed! What do I fill it with? A “dry pack” deck mortar is used to fill the bench. Do NOT use Thin-Set mortar! 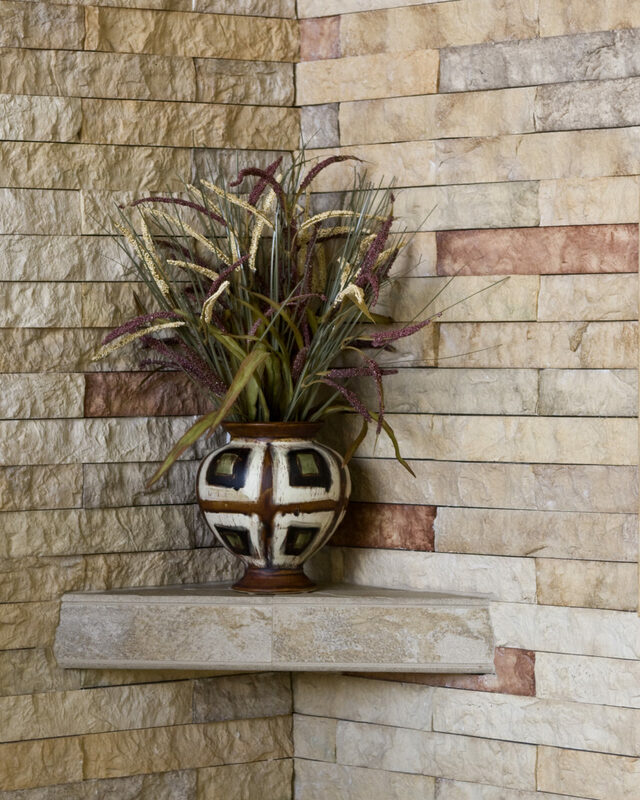 The mix ratio of the described mortar is 4 parts sand to 1 part cement – you may also use a pre-bagged mortar mix which is available at many of the tile locations that stock Better-Bench products. Additionally, you will find this mix at lumber yards, hardware stores, Home Depot, Lowes, etc. under the common name of mason mix, brick mortar, or deck mud. You will be adding just enough water to allow you to “chop” (a garden hoe works best!) the mixture to consistency that allows you to pick up a handful and shape it into a ball without getting it all over your hands. Be sure to blend the mixture to the point that all dry powder pockets have been eliminated. Fill the entire bench with the mortar, and pack it tight as you go with a wood float, block of wood or even a steel trowel. Make sure the material is in all corners completely. Allow the mortar to build up about 1/4 – 3/8 of an inch along the back wall(s) of the unit and screed it flush to the front lip to provide adequate drainage of the horizontal surface (this is not necessary in “dry” areas). Then add a small amount of water to the remaining mix to make it a little bit stickier. You will then apply this mix to the front face and screed it flush with the top and bottom edge of the channel. 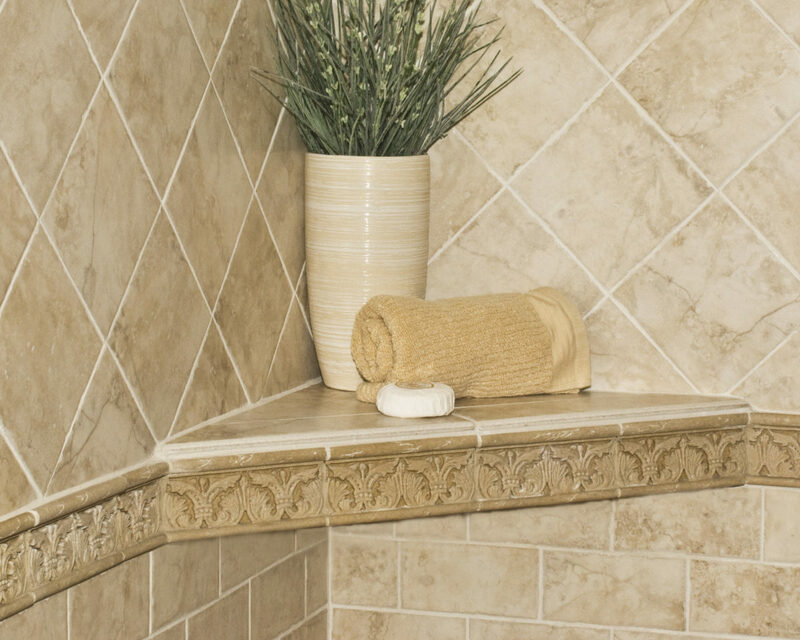 allow the unit to set sufficiently prior to beginning your tile process. Do I need to connect to wood studs or install blocking? No! Better-Bench products are designed to meet a 400 LB load capacity by using the supplied hollow wall anchors. However, wood framing members may be encountered during installation, or the installer may just feel more “comfortable” connecting to framing. If this is the case, discard the hollow wall anchors and use the pan screws that are also provided. 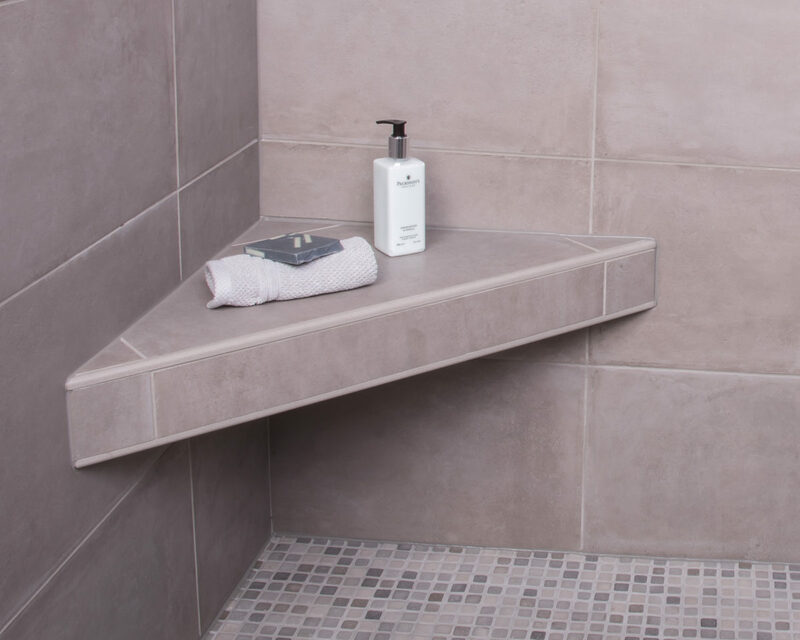 The Adjustable bench (ADJR) is suitable for mounting directly to the face of the substrate (ultimate method), or after finish tile has been installed. Wood blocking is not required unless INVISABOLT mounting supports are being used in the installation. What type of backing (substrate) do I need? Better-Bench products are designed to be mounted over a U.B.C. (Uniform Building Code) or T.C.A. 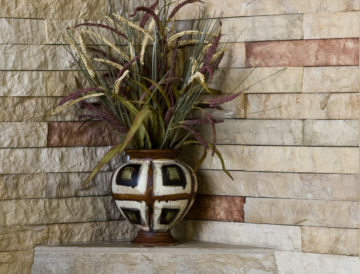 (Tile Council of America) approved tile substrate. 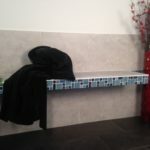 When should I install the bench, before I start tiling? Better-Bench products are extremely adaptable systems. 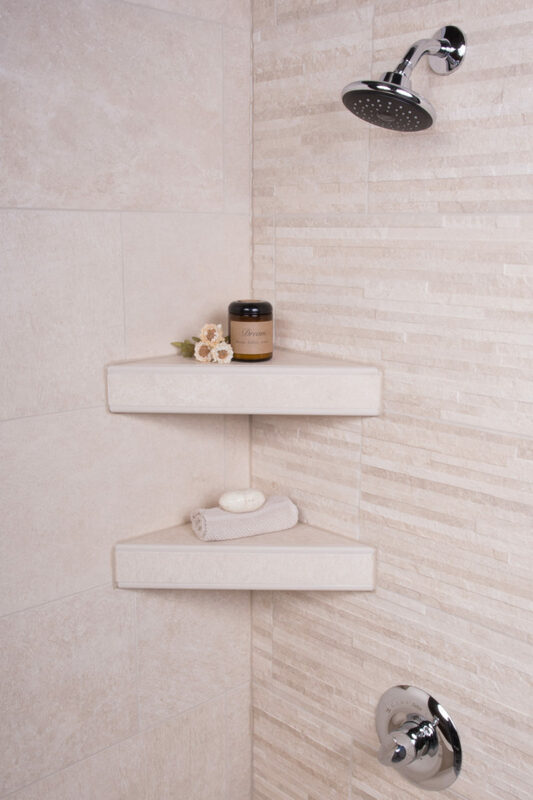 You may install the product over the finish tile at any time, however, the optimum method would be to mount the product directly to the face of the substrate. 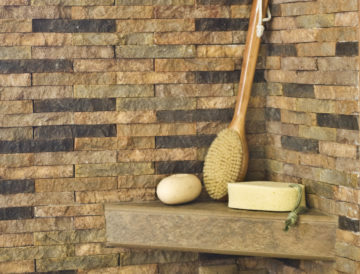 This may be done before you begin tiling the wall, or for additional advantage, you may begin tiling and then when you get to the course of tile where you wish to mount the bench, take a few moments and mount the bench at this time. Then finish your wall tile and fill and tile the bench at the end (this method may save a few cuts of tile and eliminates the need to reach under the bench to lay tile). If you are using the Adjustable bench unit in combination with the Invisabolt support system, pre-installation of a minimum of 4×6 wood blocking prior to the substrate going up is REQUIRED. Please refer to the Adjustable Bench product installation instructions or contact us directly for further assistance. Do I tile the bottom? 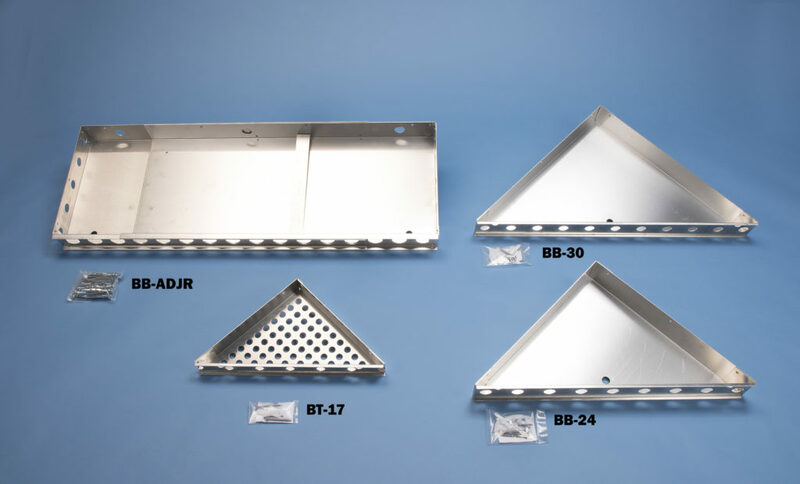 It is not necessary to tile the bottom of the BB-30, BB-24, or ADJR bench. It is mounted down the low and therefore the bottom is not visible. The alloyed aluminum will not rust or corrode, and it leaves a smooth metal surface exposed that will not harbor mold or mildew growth, as well as it is easy to clean. 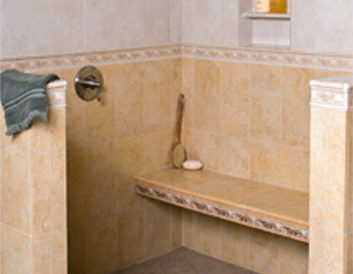 you may tile the bottom, if desired, by using a metal bonding tile mastic, or by simply screwing a piece of backer board substrate material to the bottom if the bench with galvanized flathead screws. Remember, you must leave the weep hole clear of any obstruction so that any penetrating moisture will be able to escape from the interior of the bench. 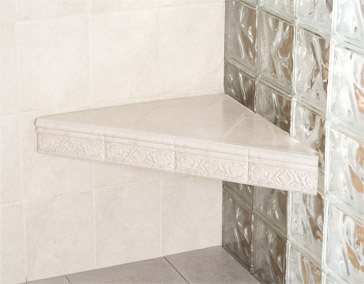 If you are using the BT-17 or BT-17S, we do require that you tile the underneath of the bench. The BT-17 was designed to be used as a shelf and is therefore installed at a higher level than the bench seats, hence leaving the bottom visible. 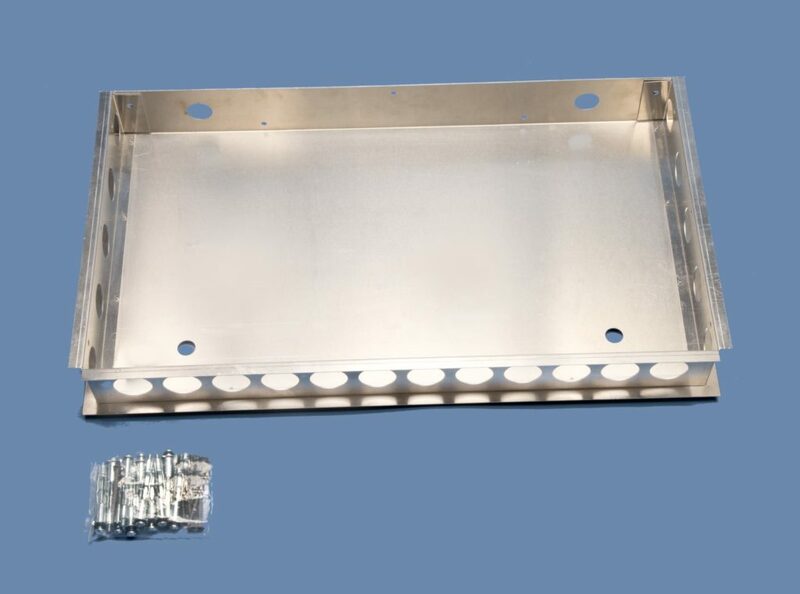 You will notice this size has several holes in the tray, which is designed to allow the mortar mix to slightly penetrate through, in turn providing a surface for the tile to adhere to. Do I need additional waterproofing? No! Better-Bench products are designed to mount in a manner that do not require additional waterproofing membranes, nor will it compromise the membranes in the wall. 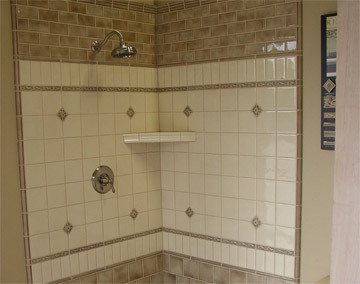 Waterproofing is accomplished by injecting a small amount of caulk in the screw locations prior to their insertion. 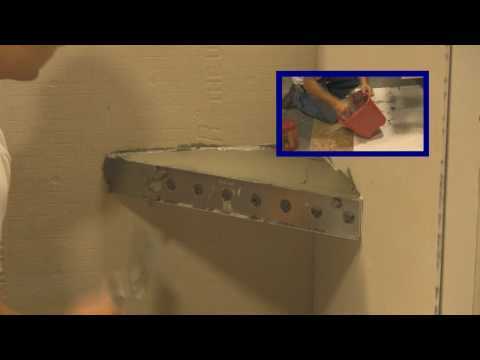 Additionally, you will apply a bead of caulk over the top most edge of the bench unit where it meets the wall. 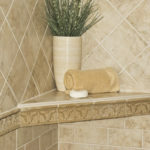 This will divert any moisture that has penetrated the grout anywhere above the bench line, into the bench itself, and away from the screw locations. Caulk may be added around the fastener heads inside the bench for additional assurance against water penetration at the screw locations. Does the mortar eat away the aluminum? Our products are produced of an “alloyed” aluminum which is engineered and suitable for a direct mortar contact. Etching of the aluminum does occur and is considered a normal reaction upon mortar contact. 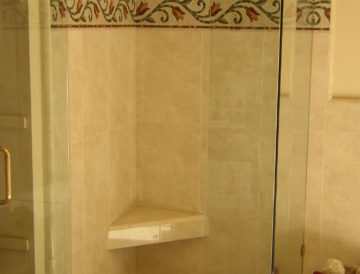 In some instances, usually if excessive moisture is allowed to penetrate the finished unit through grout transmission, or if the initial mix is too “wet”, this reaction may continue to cause unsightly staining of the aluminum. 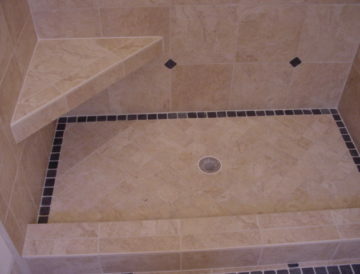 it is therefore recommended that the mix ratio and water content be carefully observed during installation, and that the tiled top surface of the bench be sealed with a commercially available grout sealer. 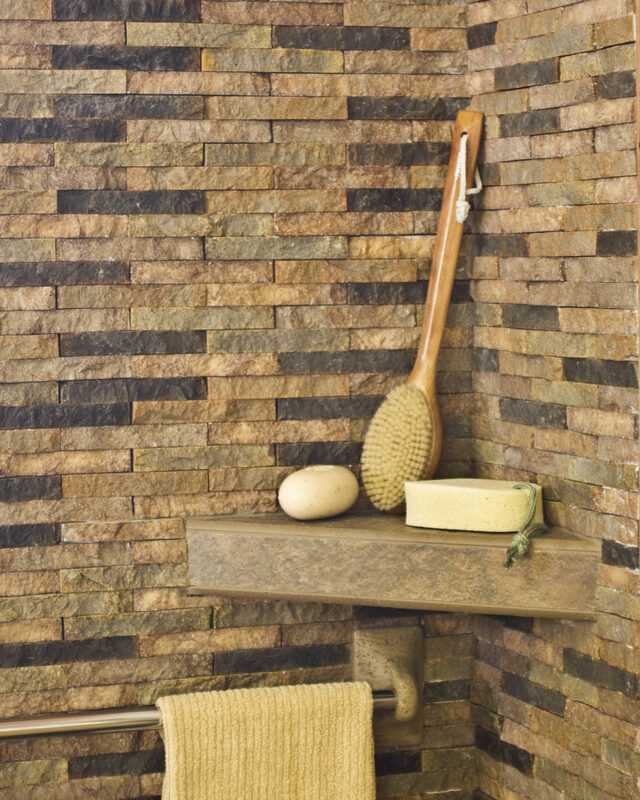 Generally, the sealers are recommended for all tile and grouted surfaces and are easily applied and relatively inexpensive to acquire. Most Better-Bench product installation guidelines apply to the BT-17. Review also the items posted in that section for pertinent information! 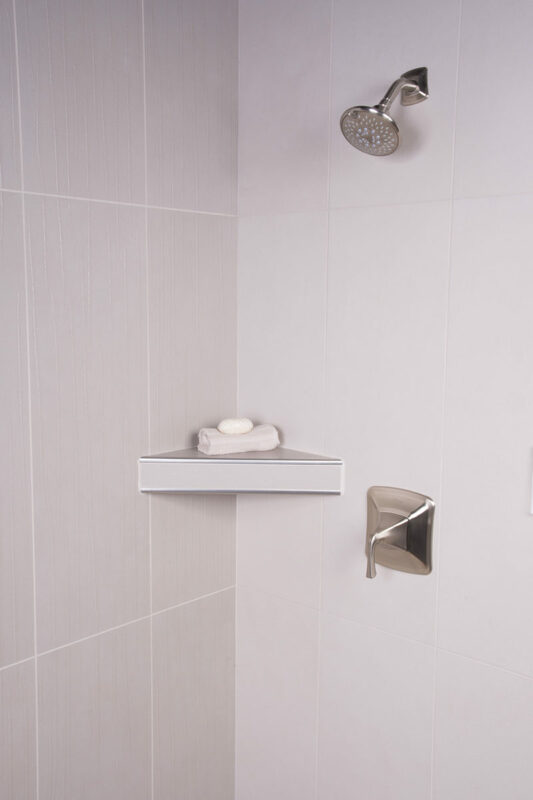 The BT-17 has a 100 lb live load capacity due to the amount of fasteners supplied with the unit and based on a retro-fit, or over the tile, method of installation. the capacity can be substantially increased by installing additional fasteners and/or mounting the nit directly to the face of the substrate. Can I then use this unit for a footrest? Yes. We are aware that many people are installing the BT-17 low for that very purpose. It is best to mount the unit to the substrate first, if this is an option. Otherwise, you will need to install 3 additional fasteners (not included) that meet or exceed the shear value of the fastener we supply. Call for additional details if necessary. Do I tile the underneath? Yes. You will need to tile the bottom of the BT-17 due to the exposed mortar. This mortar may harbor mildew or mold growth if not covered. How do I tile the underneath? The BT-17 was anticipated for a higher mounting location than our other bench products. It has therefore been designed with a series of 1/2″ holes completely perforating the bottom of the unit to make is easy to tile. 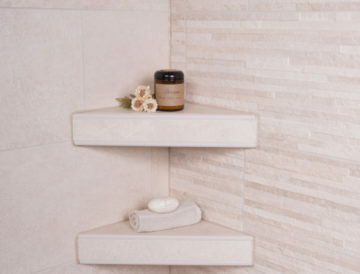 You install the bottom tiles using standard thin-set or mastic which will adhere via the direct bonding path to the exposed mortar in these holes. 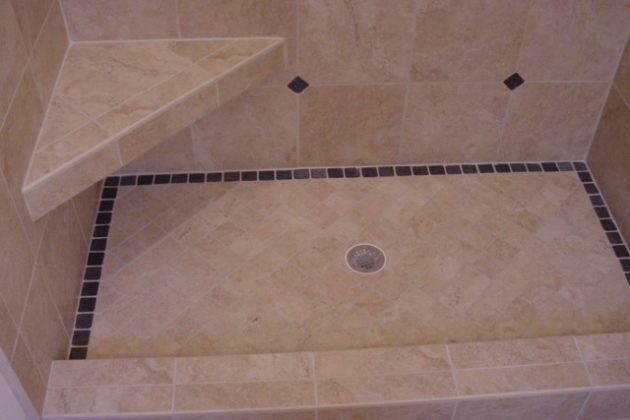 Grout and seal as normal.